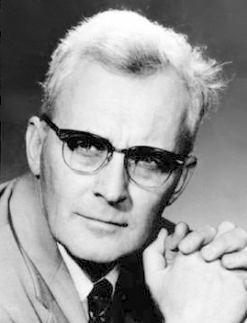 Hugh Winder Nibley (born March 27, 1910 in Portland, Oregon - February 24, 2005) was one of The Church of Jesus Christ of Latter-day Saints' most celebrated scholars. Nibley was notable both for vigorously defending the church and for frankly discussing what he saw as the shortcomings of the LDS people and culture. A prolific author and professor of ancient scripture at Brigham Young University, he was fluent in the Latin, Greek, Hebrew, Egyptian, Coptic, Arabic, German, French, English, and Spanish languages. He also studied Dutch and Russian during World War II. Nibley served as a missionary for the Church in Germany. He served as a master sergeant working in military intelligence for the 101st Airborne Division of the United States Army during World War II. He was among the force on Utah Beach that invaded Normandy on D-Day, and he witnessed remnants of the horrors of the Nazi concentration camps. Nibley began his studies at the University of California, Los Angeles, and earned a doctorate at University of California, Berkeley. While at Berkeley, he reportedly perused all of the library shelves, beginning on the first floor and moving up. When a book's title struck his fancy, he would then read the book. At the request of Apostle John A. Widtsoe, he became a professor at Brigham Young University in 1946. Nibley was praised by non-LDS historians and researchers for his ability to draw upon historical sources to give evidences for Latter-day Saint beliefs. In one study the authors argued—due to Nibley's reliability and celebrated scholarship—that most of Nibley's work is reliable, encouraging anti-Mormon writers to assess and counter Nibley's research, rather than dismissing it. Nibley's research drew from Egyptian, Hebrew and early Christian histories, and he often took his notes in a mix of Gregg shorthand, Arabic, Hebrew, Greek, and Egyptian. Nibley "insisted on reading the relevant primary and secondary sources in the original and could read Arabic, Coptic, Dutch, Egyptian, French, German, Greek, Hebrew, Italian, Latin, Old Norse, Russian and other languages at sight." In a perceptive critique, William J. Hamblin, a colleague of Nibley at BYU, remarked that "Nibley's methodology consists more of comparative literature than history." Douglas F. Salmon has examined in depth Nibley's comparative method, focusing on the latter's work on Enoch. Among other topics Nibley wrote about were temples of the church, the historical Enoch, and similarities between Christian Gnostic and Latter-day Saint beliefs. He also wrote direct responses to anti-Mormon literature. His work "Approaching Zion", an eloquent indictment of capitalism and endorsement of communalism, is widely considered a classic of Mormon literature. Often, Nibley was considered the foremost Mormon apologist, and on occasion has been referred to as "defender of the faith," a title that has been widely shared by only one other Mormon: historian and Church leader, B.H. Roberts. Also well-known is Nibley's signature for many papers and articles: "I KNOW THE GOSPEL IS TRUE." Prior to becoming ill, he had a little office in the Harold B. Lee Library at BYU, where he worked on his magnum opus titled One Eternal Round, which focuses on the hypocephalus ("Facsimile 2") in the Book of Abraham. He turned over the materials for his last book to FARMS in the late months of 2002. Co-author Michael D. Rhodes, who had been working with Nibley on the book since 1993, condensed and distilled Nibley’s thoughts and research into a finished manuscript. Kresimir Cosik, international basketball star, Churchman, and diplomat. Benjamin Urrutia, writer and scholar. Makhshava - This Hebrew word is usually translated as "thought," but Dr. Nibley made a case for translating it as "plan." E.g., in the book of Esther most translations say that Haman "thought" to destroy the Jewish people. It is more accurate to say he planned to exterminate them. He did not just think about it, but made a plan. Shiblon - This Book of Mormon name, Dr. Nibley pointed out, is almost certainly connected to the Arabic shibl, "lion cub." Nibley's student Benjamin Urrutia went on to make the connection with the "Jaguar Cub" imagery of the Olmec people of Ancient Mexico, a theory that has been widely embraced by LDS scholars. Hugh Nibley died February 24, 2005. He had been confined to bed by illness for over two years before his death. This page was last edited on 30 November 2013, at 20:02.